Tigerair Australia has today announced that it will re-commence flights between Hobart and the Gold Coast from 30 October 2018. Tigerair will operate three return services per week between the two destinations and it will be the only low cost carrier to offer direct flights on this route. 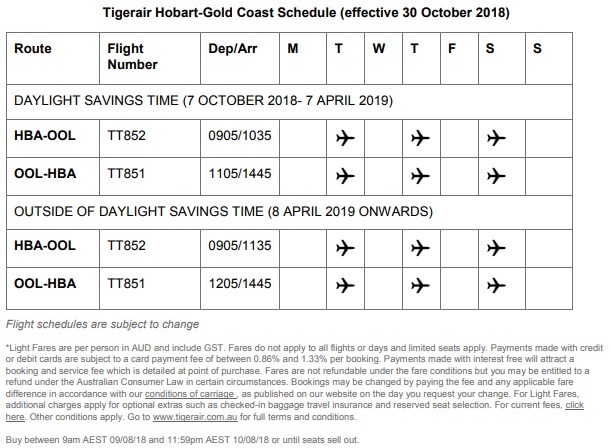 To celebrate today’s announcement, Tigerair has launched a sale for flights between Hobart and the Gold Coast starting from $69.95 each way* for travel between 30 October – 13 December 2018. Flights can be booked at tigerair.com.au and the sale will run until 11:59pm, 10 August 2018 (AEST), unless sold out prior.